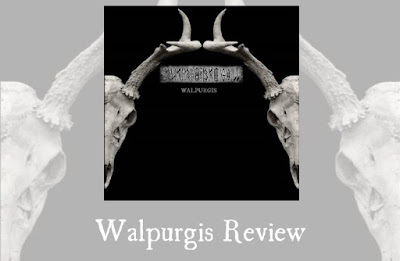 Walpurgis, or ‘witches night’, is a brilliant idea to create some dark ambient around. Ruairi O'Baoighill, a dark ambient/drone artist based in Ireland, has done just that, and it’s certainly a riveting listening experience. There is a starkness to Ruairi’s tracks on Walpurgis, often seemingly just a few elements interacting or alternating with each other to create dark soundscapes that clutch the mind. He makes great use of vocals, whether in the form of guttural gut-clenching chants or rhythmic invocations to who knows what. He also uses drones and lone drumbeats to puncture the dark bubble that his music conjures, in my mind at least. Throughout the whole of Walpurgis, any mental images that came to me revolved around a small fire, a robed figure nearby and an immense and crushing darkness filling every other part of the space. The effect might be a bit like looking at a photo of the Moon in space, but zooming out until it’s the size of your thumb on the screen. I’m strange, I know. Walpurgis contains five tracks, each titled with a simple Roman numeral. They all gravitate to around five minutes in length, give or take, saving track five which reaches seven and a half minutes. I felt that each told its own stage of a tale, or rather suggested one. Track I seemed to very much be an invocation, the pacey vocals and guttural sounds seeming to interact in some kind of battle, the speaker entering into occult conversation with a dark entity at the fringe of the small fire. Track II seems to be full of whispers and gong-like sounds, maybe containing the aether’s response to the ritual, the performer gaining the attention of the keepers at the gate? If track II is the response, track III seems to be a reversal of some kind, the banishing of the thing that was called forth. Single bashed-drumbeats and what sounds like shattering metal is joined by ghostly cries and screeches. I saw the fire spitting sparks into the blackness above, and heard a guttural chuntering that hinted at the banishment hurting the thing that is lurking unseen. Track IV seemed to be a period of respite, the starting drone joining with shimmering notes that rise and vanish again and again. Maybe the caster is waiting to see just what the result of the rite will be. The last track starts with a warped gong and a muted rumbling, a bit like you might hear underwater during an earthquake. A guttural chant reveals the thing is still there. Ghostly sounds meet with guttural tones (how many times have I said guttural in this review!) as if building to an unleashing of the wrath of something that shouldn't have been called. The more rhythmic invocation begins again near the end, the robed figure trying once more to control the uncontrollable. At this point, you could happily loop back to track one and listen to the whole thing again, seeing it as the figure's second attempt, an attempt doomed to follow the same course. Or maybe we are joining the events mid-loop, the figure and adversary already locked in a sinister struggle for millennia. I don’t know, but I like the thought of it. I enjoyed the time I spent listening to Walpurgis. I found its various elements conspired to create a surprisingly dark soundscape that grew stronger as time progressed, the twists and variations of these elements seeming to reinforce the feelings of dark energies and abyssal meddlings. Great stuff indeed. I was given a free copy of this album for review purposes.